This tutorial provides a brief information on all 32 keywords in C programming. This statement suggests that var1 is a variable of storage class auto and type int. Variables declared within function bodies are automatic by default. They are recreated each time a function is executed. Since, automatic variables are local to a function, they are also called local variables. To learn more visit C storage class. The break statement makes program jump out of the innermost enclosing loop (while, do, for or switch statements) explicitly. The continue statement skips the certain statements inside the loop. Visit C switch statement to learn more. Here, alphabet is a character type variable. To learn more, visit C data types. An identifier can be declared constant by using const keyword. To learn more, visit C variables and constants. Here, number is single precision floating type variable whereas, longNumber is a double precision floating type variable. In C programming, if and else are used to make decisions. To learn more, visit C if...else statement. Here, a enumerated variable suit is created having tags: hearts, spades, clubs and diamonds. To learn more, visit C enum. The extern keyword declares that a variable or a function has external linkage outside of the file it is declared. To learn more, visit C storage type. To learn more, visit C for loop. Error, count cannot be 10. To learn more, visit C goto. Here, count is a integer variable. The short, long, signed and unsigned keywodrs are type modifiers that alters the meaning of a base data type to yield a new type. 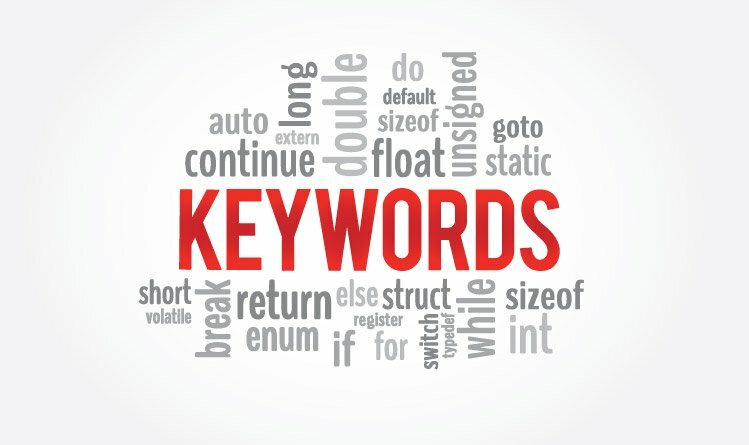 The return keyword terminates the function and returns the value. This function func() returns 5 to the calling function. To learn more, visit C user-defined functions. The sizeof keyword evaluates the size of data (a variable or a constant). To learn more, visit C operators. The register keyword creates register variables which are much faster than normal variables. The struct keyword is used for declaring a structure. A structure can hold variables of different types under a single name. To learn more, visit C structures. The typedef keyword is used to explicitly associate a type with an identifier. A Union is used for grouping different types of variable under a single name. To learn more, visit C unions. The void keyword indicates that a function doesn't return any value. Here, function testFunction( ) cannot return a value because the return type is void. The volatile keyword is used for creating volatile objects. A volatile object can be modified in an unspecified way by the hardware. Here, number is a volatile object. Since, number is a constant variable, the program cannot change it. However, hardware can change it since it is a volatile object.